RingCentral is a cloud-based VoIP phone system provider with tiered pricing plans between $19.99 and $69.99. Prices vary depending on the number of users and if monthly or annual billing is chosen. Specific features are provided with each of its four tiers, but all include unlimited calling, faxing, texting and access to the mobile app. Thanks to the volume discounts provided with 10 or more users, Ringcentral’s price per user goes down as your business grows with more users, giving you more value for your money. There are four different service plans, which vary by price and included features to meet specific needs, and a 15-day free trial is available for anyone to try the service. The Essentials is RingCentral’s starter package. The price is $29.99 per month if you choose the monthly payment option, and $19.99 per month if you choose the annual payment option. This package is only available if the business has between one and 10 users. If you are a solopreneur with only one user, this plan is $39.99 per month and $29.99 per month if you pay annually. The Premium package beings at $44.99 per user for two to 99 users when you choose the monthly payment option. If the annual payment option is selected, the price drops to $34.99 per month. For 100 to 999 users, the price is $42.99 monthly per user and $32.99 per user if paid annually. With over 1,000 users, the price is $29.99 per month if paid annually, and $39.99 if paid monthly. If you are a solopreneur, the cost for this RingCentral plan is $54.99 per month. The Ultimate package begins at $59.99 per user for two to 99 users when you choose the monthly payment option. If you opt for annual payments, the cost gets reduced to $49.99 per month. With 100 to 999 users, the Ultimate plan costs $52.99 per user for monthly payments and $42.99 monthly per user if paid annually. If a business has over 1,000 users, this RingCentral plan will cost $49.99 per user if paid monthly and $39.99 monthly per user if paid annually. If you’re a solopreneur, this plan is a whopping $69.99 per month if you pay monthly, and $59.99 if paid annually. RingCentral is designed more for medium- to large-sized businesses and enterprise corporations, and this is apparent with the bulk of RingCentral’s features only being available with the Premium or Ultimate plans. However, there are still a lot of features that provide value for smaller businesses that want to use the Essentials or the Standard plans. The number of phone lines available is defined by your RingCentral plan and the number of users. Every user gets unlimited calling, conference calling, and SMS. Call management features such as call forwarding, logs and transfers are also included with every plan and you’ll get between 100 and 10,000 toll-free minutes depending on the plan selected. All these can be had for as low as $19.99/month per user if you bill monthly. Faxing is only available if you’re on the Standard plan or higher. For users on the Standard plan or higher, RingCentral provides an auto-attendant (called a virtual receptionist by RingCentral) that greets your callers and routes them to different users and extensions. You can configure business rules for the receptionist to route calls at a certain time or send users to voicemail. You can also configure your on-hold music or even record your own custom greetings for callers with the standard plan for $34.99/month per user if you bill monthly. Every voicemail received is automatically sent to your email address with the message as an audio attachment, regardless of the plan selected. With the Premium or Ultimate plans, which are $44.99 and $59.99 per user if you bill monthly, these voice messages are automatically transcribed and sent as a readable email or text message to the mobile app. No matter what plan you select, RingCentral provides a softphone mobile app for iOS and Android phones and tablets at no additional cost. Since the entire VoIP system is cloud-based, you can control every aspect of your account from the palm of your hand. Make and receive calls, host conference meetings, modify auto-attendant settings and configure your account all through your smartphone. Users on the Premium or Ultimate plan can easily enable automatic recordings for inbound and outbound phone calls. For $44.99 or $59.99 per month per user, you can save as many as 100,000 recordings per account, and these are stored for up to 90 days in the online portal. Users on the Standard plan, which starts at $34.99/month per user if you bill monthly, will have to manually initiate the recording of calls, and Essentials users won’t have this feature available to them. With the Premium or Ultimate plans, RingCentral integrates with Salesforce and Zendesk, which can both be used to track all activity and interactions with your customers. The benefit of having these integrations is that you can place calls to your customers directly from these applications. Also available is a fully-integrated video conferencing solution called Glip, which allows you to host video meetings with your RingCentral account without needing to use another application. If you’ve ever had to manage an old hardware-based phone system, you’ll be in for a pleasant surprise when you see how easy it is to manage your phone system with RingCentral. It removes the clunky phone and switchboard hardware and puts it all in the cloud. You’ll still have desk phones in your business, but they are now connected to the internet so you can easily make calls from your desk phone, your computer and your cell phone using a mobile app. Through the cloud-based management system, you can add new users, send texts with your connected devices, send and receive faxes, hold conference calls and even connect multiple office locations with one system. You can configure a virtual receptionist to greet your callers, route calls to specific extensions or departments, and set answering rules such as hours of operation. Since your system is in the cloud, it’s simple to connect and manage your business phones from many different locations using an internet-connected PC, smartphone and tablets. Other users in your business will have the ability to manage many aspects of their usage, so they take less of your time and resources. If you need to be mobile and able to respond quickly to the needs and expectations of your customers, there is a RingCentral plan for you. It’s a feature-rich system with incredible volume discounts to provide additional value as your business grows. While there are plans designed to fit businesses of any size, we only recommend RingCentral for larger businesses that can leverage the volume discounts to be had with 1,000 or more users and the robust set of features. If you’re a smaller operation, we recommend either Nextiva, our top recommended VoIP provider, or Grasshopper, our best virtual phone provider. Both are great fits for smaller businesses and solopreneurs. The increased need for mobility and rising customer expectations for companies to be highly responsive require businesses to have a more robust phone system that allows for easier customer engagement. With RingCentral, you get a cloud business communication solution that empowers you and your employees to manage calls from anywhere in the world. RingCentral has a strong set of capabilities along with an extensive set of features, including mobile integration and unlimited SMS. The robust system is offered at a fair price with no contractual requirements, and provides a lot of scalability as the system grows with your business. However, along with these benefits, there are still some drawbacks to using RingCentral. Salesforce, Google, Zendesk, Outlook Integration: Direct integration with business tools you already use, making managing your customers and employees that much easier. Video conferencing: The built-in video conferencing tool makes holding conferences a piece of cake, without needing to use additional software. Incredible mobility: The ability to control every aspect of your account from your mobile device is a tremendous benefit. Pricing: The volume discounts offered present huge savings for businesses with multiple users. The more users you have, the more you save. Managing robust features: All of RingCentral’s features can become time-consuming to manage with a lot of users. Pricing: The price for a single user or solopreneur is much higher than other VoIP systems on the market. Interface speed: The web portal can sometimes be a bit sluggish, which presents a challenge if you need to modify settings quickly during peak business hours. Most businesses that use RingCentral are satisfied with the wide range of features offered and the simple pricing with no additional fees for features. On the other hand, business owners with specific needs were disappointed with the inflexibility of the plan structure. For a more in-depth summary of user reviews, check out our user reviews of RingCentral. 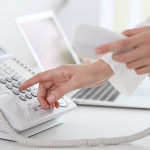 RingCentral is just one of many VoIP phone systems available to businesses. There are many other providers that offer the same level of features, options and competitive pricing. There are also a handful of virtual phone providers that offer a comparable feature set for the same price or less. So, if RingCentral is too robust, complicated or expensive for your needs, there are some other providers to consider. Nextiva is a VoIP phone system and our top recommended VoIP service. They offer the best combination of features, customer support and price. From a solopreneur to a business with a large team, Nextiva provides a wide array of calling, collaboration and mobile features that give tremendous value to any business looking for a fully-featured phone system. Grasshopper is a virtual phone system. It requires no equipment and allows users to easily switch between their business and personal numbers on their mobile phone. It’s our top recommended virtual phone system and is best for the solopreneur that is just getting started with their own business. Phone.com is another virtual phone provider that provides an easy to use virtual phone system with premium features and flexible pricing. Recommended as our top vanity phone number provider, it’s best for the small business that wants to brand themselves with a vanity phone number. RingCentral offers a cloud-based VoIP system that is packed with features perfect for the growing business. With detailed call handling capabilities, options, video conferencing and a mobile app to manage your system on the go, you’ll find everything you need in this scalable business phone system. If you’re looking for a feature-rich business phone system that’s easy to set up, use and can grow with your business, you can’t go wrong with RingCentral. They offer a 15-day free trial so you can try the system to see how it works for your business before purchasing the service. Start your free trial by clicking the button below.